OLYMPIC NATIONAL PARK — Olympic National Park has installed two new temporary bridges on Olympic Hot Springs Road across the Elwha River, but visitors will still need to walk or bike in if they want to see the Elwha Valley. 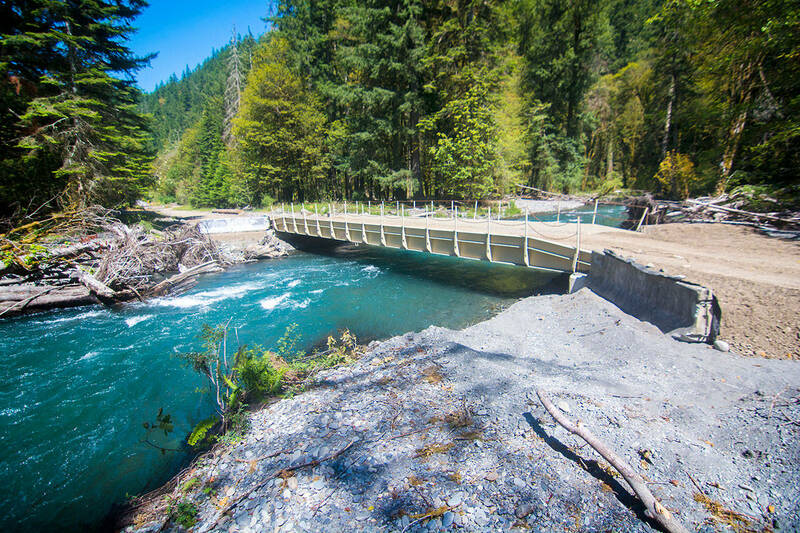 The park finished installing the two bridges Friday, allowing park staff to work on projects beyond the former Elwha Campground where the road washed out last winter, said ONP spokesperson Penny Wagner. “Right now public access is going to be by foot or by bicycle even while we have those temporary bridges,” she said. She said she was unable to confirm Monday with the Federal Highway Administration as to why the bridges cannot be opened to the public. Those bridges will allow park staff to work on roofing, painting and structural issues in the buildings near the ranger station, just south of the washout, before more damage is done to the road during future storms. “They aren’t going to have maintenance for the next few years,” she said. She said crews are also going to spend the summer working on Olympic Hot Springs Road and Whiskey Bend Road in anticipation for winter storms. Once the weather starts to worsen in late summer or early fall, the park will remove the two new bridges and the older bridge the was put in temporarily after a nearby section of river washed out in 2015. That bridge is on loan from the Federal Highway Administration and needs to be removed before the river takes it, she said. It will stay in the park for now, she said. Once the bridges are out, anyone looking to access the Elwha Valley will need to use the bypass trail that takes visitors around the washout area. She said the temporary bridges will allow crews to move forward on geotechincal testing on Olympic Hot Springs Road, part of the park’s effort to assess the possible relocation of the road. The park has been fighting to maintain visitor access to the Elwha River since the National Park Service led the $325 million effort to restore the Elwha River to its natural state with the removal of the Elwha and Glines Canyon dams. The river has been free from the two dams since 2014, which has allowed the river to move through its floodplain. The park is also preparing an Environmental Assessment as it looks at testing a possible new route for Olympic Hot Springs Road. The EA is needed before geotechincal testing can move forward on that route. The EA isn’t required to drill into the existing road. She said the EA recently finished internal review and was forwarded to the regional office for review. The park hopes to have the EA available to the public this September, she said. Once the study is finished, the park would continue preparing a second environmental assessment that would address relocating the road, modifying the road on the current alignment or doing nothing. In all, the park has spent more than $450,000 on its temporary efforts to maintain visitor access in Elwha River Valley.